As you may have already guessed by some of the posts I’ve written in the past, I’m concerned with eating healthy and exercising in addition to the occasional brownie cookie or chocolate cake mug. Recently, I began working with a personal trainer online: I’ve put on some love weight since I began dating my fiance, and now that we’re getting married (no date set yet), its extra incentive to get into the best shape of my life. Long story short, my trainer advised me to start eating a solid mix of carbs and protein in the morning before my workout (which I’ve been doing on an empty stomach for years), but the problem is, I’m not a fan of protein shakes. I just can’t stomach a sweet chocolate or vanilla protein shake that early in the morning, so I had to come up with another easy, fast way to get some good nutrition in before lifting, and I came up with my first high protein maple muffin, and it’s awesome. Trust me on this. The vast majority of muffins, homemade or not, are usually loaded with sugar, butter and oil. But not these babies. I’ll admit, I was skeptical of using cottage cheese, oatmeal and maple syrup to make tasty muffins, but by Jove, they are! With a muffin and a glass of milk, I’m ready to go in the morning, no whey protein shake required. And they’re just sweet enough to be a muffin, but not too overpoweringly sweet to taste like a cupcake. Preheat the oven to 350 degrees Fahrenheit and spray six medium-sized muffin molds with non stick cooking spray. In a blender, mix all the ingredients together until it forms a thick and smooth batter. Pour the mix into the muffin tin molds and bake for 30 minutes, until a toothpick comes out of the center clean. Store on the counter in plastic baggies or freeze and defrost in the microwave when ready to eat. 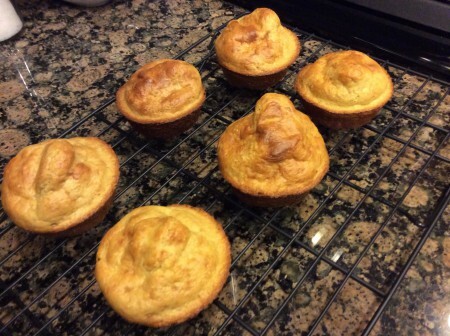 This entry was posted in Breakfast, Recipes and tagged Breakfast, High Protein, High Protein Maple Muffins, High Protein Muffins, Maple, Maple Muffins, Muffins, Recipes on March 25, 2015 by Paige N..